A HIGHLY IMPORTANT MUSEUM QUALITY YEAR DURATION VIENNESE WALL REGULATOR. CIRCA 1810. An extremely important early Viennese wall regulator of one year duration. The ebonised case, of a style specific to this maker, has a flat top lift off hood with concave moulding and very fine carcase members to the glazed front and sides. The case then has a strong under curved and chamfered moulding to the trunk of the clock, which is deeper than the hood. This has a large lift out door at the front and large glass panels to both sides. The case ends with an under cut curved moulding typical of Viennese wall clocks. The whole case is extremely narrow and elegant. The white enamel dial, signed for the maker ‘Wibral in Wien,’ has Roman numerals and finely wrought heart and pointer shaped hands. There is a large seconds ring below 12 o’clock. The dial is enclosed within a bezel typical of Wibral with engine turning both to the front section and also a rim of engine turning on the side of the bezel. This type of bezel was almost always used by Wibral and we have only seen a similar bezel on one other maker’s clock. The year duration movement has seven wheels in the train. This is an exceptionally large number of wheels in a clock train and necessitates the finest of pivots and highly accurate wheel cutting, which was difficult to achieve in the early 1800s. The clock has a very delicate deadbeat pinwheel escapement. 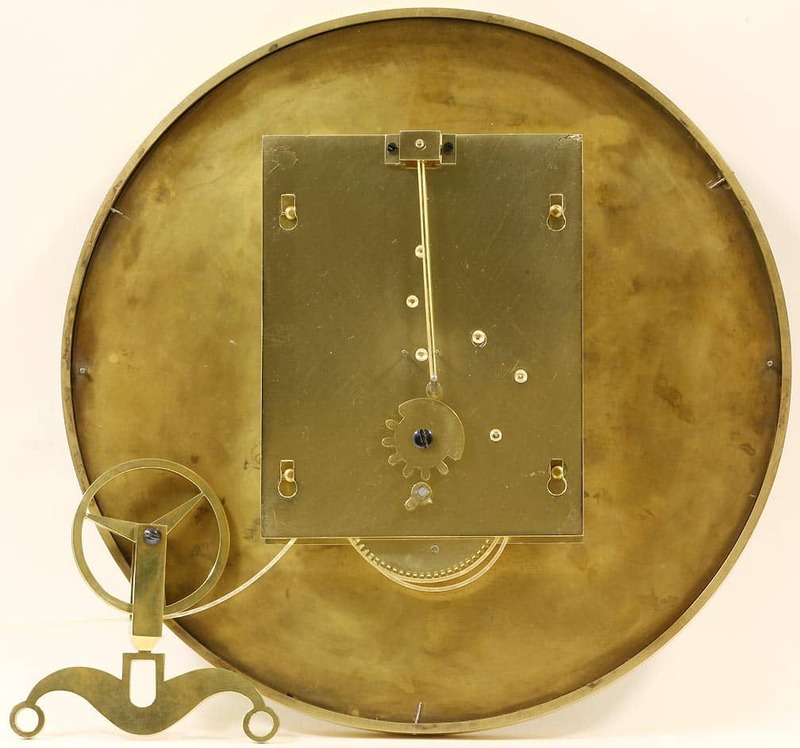 It has a metal rod pendulum which is suspended on a knife edge which is gimballed and fully adjustable and fixed to the movement mounting on the backboard of the clock. 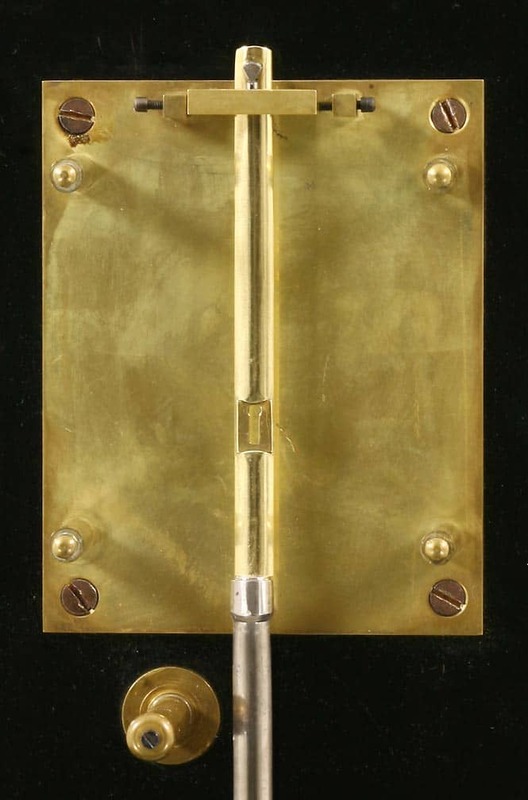 The pendulum has a polished brass bob and rating nut. 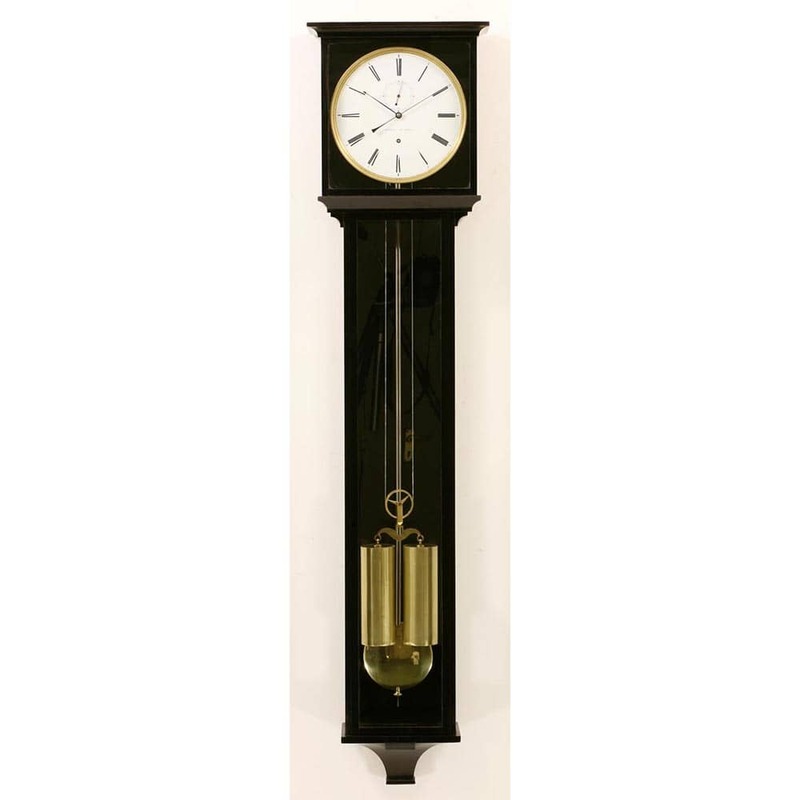 The clock is driven by twin brass weights hanging from a yoke and pulley in a style almost always used by this maker. The maker Mathias Wibral worked from about 1799 to 1823 and is one of the most famous of the early Viennese makers. 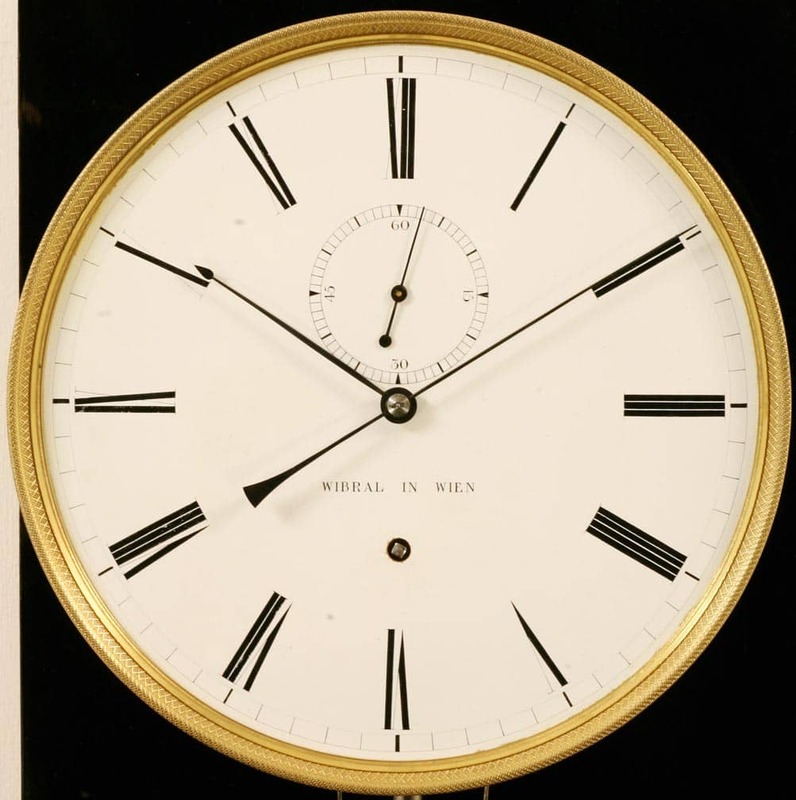 He was particularly noted for making long duration clocks and a year duration clock by him in an almost identical case is in the Viennese Clock Museum in Vienna. His clocks were particularly distinctive and always of small proportions for such long duration clocks. 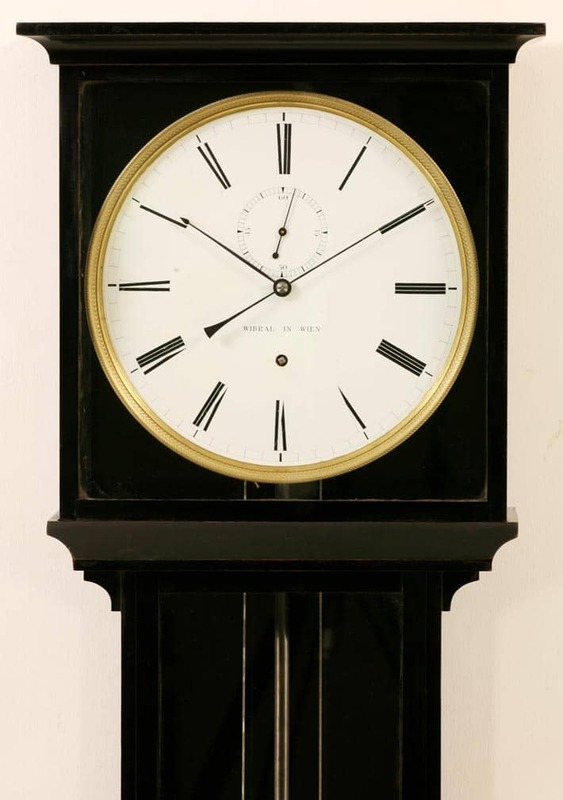 In addition to the flat top clock, like this one, he also made a very similar case style but with a roof top. Although he did make some clocks in mahogany a lot of his clocks are in ebonised cases and this particular case style looks particularly elegant when in a black case.